Two dozen writers from around the world were invited to visit the West Bank and Gaza and to share what they saw with the world. 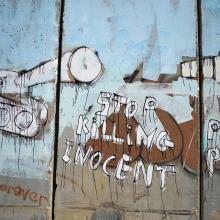 The resulting book is a collection of testimonies of the human consequences of an occupation. Trócaire is hosting the launch of a new book about the impact of Israel’s occupation of the West Bank. 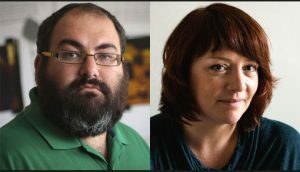 Yehuda Shaul of Israeli NGO Breaking the Silence and Eimear McBride, one of twenty-six international writers who visited the West Bank, will be present at the launch of Kingdom of Olives and Ash as part of the International Literature Festival Dublin. “This is a unique opportunity to hear first-hand testimony from the West Bank from one of Ireland’s leading authors and a leading Israeli human rights activist,” stated Trócaire. Eimear McBride will give an account of what she saw in the West Bank, while Yehuda will speak about his life as a soldier turned activist who now campaigns in defence of the Palestinian communities he once policed. The event will be chaired by the Director of Trócaire, Éamonn Meehan. Other contributors to this anthology include Pulitzer Prize-winning writers Lorraine Adams and Geraldine Brooks, National Book Award winners Colum McCann and Jacqueline Woodson, and Nobel laureate Mario Vargas Llosa. When members of Breaking the Silence (BTS) met novelist and essayist Ayelet Waldmanat at the Jerusalem Writers’ Festival in 2014, they invited her to tour Hebron, a city of more than 200,000 Palestinians, with a settlement of a few hundred Israeli settlers guarded by hundreds of Israeli soldiers, at its core. She and her husband, Michael Chabon, wanted to do something to help change the situation. Working with BTS and other local Palestinian and Israeli activists, they invited two dozen writers from around the world to visit the West Bank and Gaza to share what they saw with the world. The resulting book, Kingdom of Olives and Ash, is a collection of testimonies of the human consequences of an occupation. One writer, Dave Eggers, told the story of nearly being turned away at the border gate and spending a weekend in Gaza, with a young couple desperate to obtain visas to America to make new lives for themselves. Israeli novelist Assaf Gavron has written about the plight of Palestinian soccer players, whose efforts to participate in international competition are often frustrated at the border. The renowned Palestinian author Raja Shehadeh wrote about his friend, a Palestinian taxi driver, and the obstacles placed in front of average Palestinians as they seek to navigate the maze of the occupation. Madeleine Thien wrote about life in the small villages of the South Hebron Hills, including Susiya, where every house has been given a demolishment order by the Israeli authorities. All royalties from the sales of Kingdom of Olives and Ash will be divided between Breaking the Silence and Youth Against Settlements, a Palestinian NGO based in Hebron. The launch of the book will take place in Dublin’s Smock Alley Theatre on Sunday 27 May, from 2.00 to 3.30 p.m.